Something I didn’t realize we were missing out on in the U.S.; night markets! We just decided on heading out to Dongdaemun one restless night to walk around aimlessly. It was around 1:00 am when we decided to hail a cab from our hotel in Myeongdong, and it didn’t take too long to get there. If I am recalling it correctly, it was maybe about 10 minutes to the craziness that is Dongdaemun night market. We were dropped off in no particular place, and when we started wandering around we ended up in what was the wholesale district of Dongdaemun. Wow was it packed! There was so much merchandise, people, vendors, and customer’s walking around. Let me remind you this was at 1:00 am on a weekday. What time do these people have to be at work the next day?? Well anyways, after walking around a bit I did end up buying from a few vendors that were selling at retail prices or only had a minimum quantity that made sense for me. It’s lucky for me most of them would only sell wholesale, otherwise I would have blown half my trip’s budget on clothes, shoes, or purses that night. 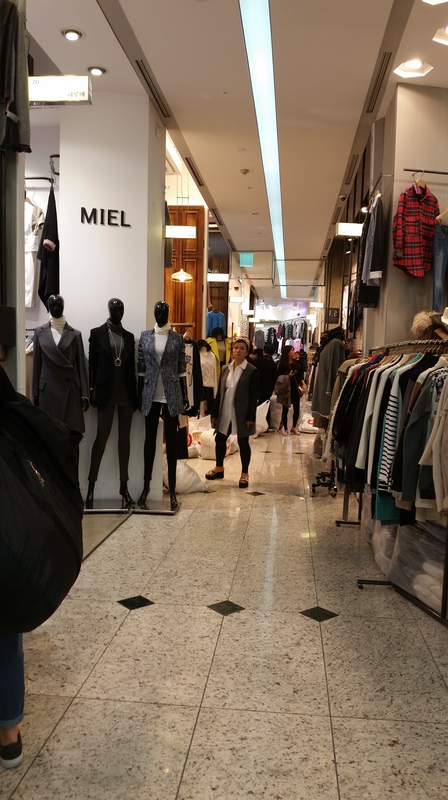 There were endless options to choose from at Dongdaemun; no wonder the women of Seoul have great fashion sense. I wish I was able to take better pictures that night, but I was so shocked at the hustle and bustle of everything that I simply forgot. I did manage to take some pictures inside. Below is a very small idea at the layout of one of the buildings in Dongdaemun. In one of the multi-story buildings we went to, there were small vendor shops lined up on each floor and they were all packed right next to each other. If I were to guess, there was probably about 15+ vendors on each floor at this 5+ story building. Outside was even more jaw-dropping. There were all kinds of vendors lined up, and a lot of deliveries being made as well. 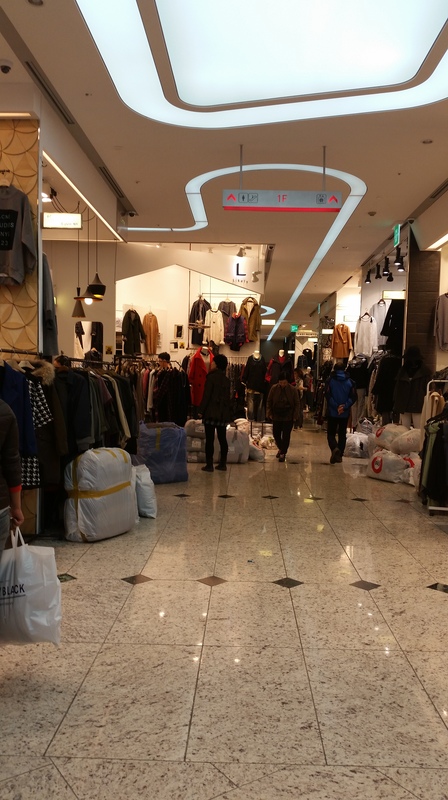 The streets were packed with merchandise in large bags (remember this is the wholesale side of Dongdaemun); just waiting to be hauled in or sold. One thing that was a MUST do for me was to eat at one of those tented roadside restaurants that I always saw in K-dramas (I believe they call them pojangmacha’s). Well, mission accomplished in Dongdaemun! The people in the restaurant were so nice and helpful right from the beginning. As soon as we walked in I could hear one of the ladies yelling “Yongo, Yongo!”. She was calling for one of their English speaking waiters to come and take our order. This simple act of eating at a roadside restaurant was a great experience. It was nice to also experience something locals do on a regular basis. 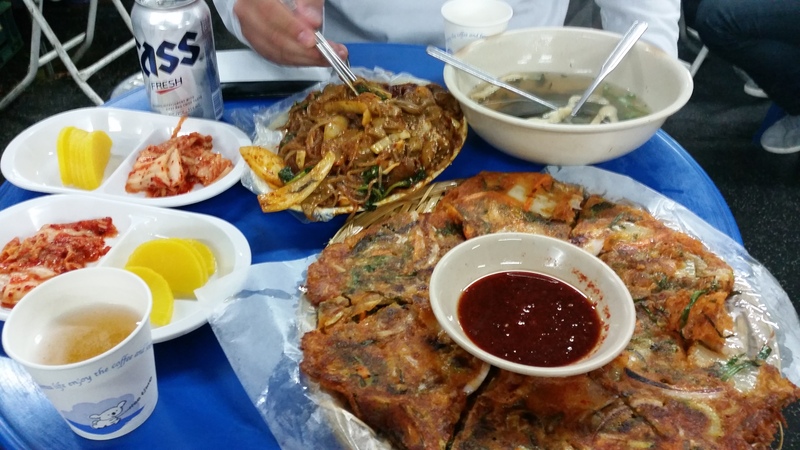 We ordered some beer (maekju), savory seafood pancake (haemul pajeon), and noodles. The food came out really quick and it was delicious. They also had given us some kimchi and soup for free. The portions were really generous and I wasn’t even able to finish my dish. There are other markets you can visit while in Seoul; Namdaemun, Gwangjang, or Noryangjin fish market. Whether you plan to go during the day or at night; make sure this is one of the things on your list of places to explore. Walking around with and taking in all the sights, smells, and sounds was something I won’t easily forget. Paradise! And grat shoes btw! Thank you! 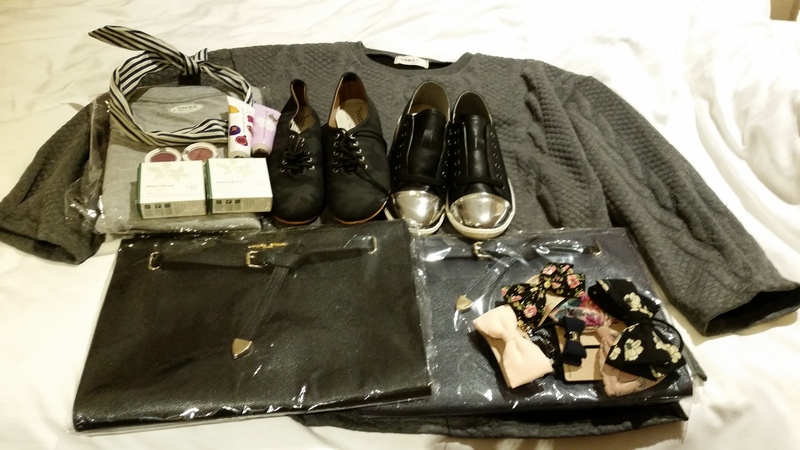 Seoul was truly a shopping mecca. Will have to to the night market when next there in March! Great post.